Two important votes are happening at the Hillsborough County Commission on Wednesday, October 1st. The Domestic Partnership Registry (DPR) and the Human Rights Ordinance (HERO). Both are important to our community and we encourage people to show up and speak during public comments. People should show up by 9am (8:15am preferably) to sign up to speak during morning public comment time in support of DPR which is on the agenda for vote in the early afternoon. The public comment process for the 1:30 pm DPR agenda item is the usual process where citizens should get here early. HERO is a second separate meeting that begins at 2pm. There’s no sign up sheet. People wanting to speak to that item are encouraged to arrive by 1pm to get processed and seated. When the Public Hearing begins Chair Sharpe will ask those who are interested in speaking, to come forward. You can also send the commissioners an email by clicking here. Authorize the County Attorney's Office to set and advertise a Public Hearing for October 15, 2014 at 2:00 p.m. to consider enactment of the Hillsborough Health, Education and Life Planning ('H.E.L.P.') Ordinance and Advanced Directives and Domestic Partnership Registry. No financial impact to the County is anticipated except the cost to publish the required legal notices. Conduct a public hearing to consider enactment of an ordinance amending Hillsborough County Code of Ordinances and Laws, Chapter 30, Article II (Hillsborough County Human Rights Ordinance No. 00-37) to, among other things, prohibit discrimination within Hillsborough County on the basis of sexual orientation or gender identity or expression in connection with employment, public accommodations, real estate transactions, and County contracting and procurement, to expand the scope to prohibit discrimination in credit extension practices for all protected classes, and to provide for additional exemptions. The County will incur no additional costs related to the enactment of this ordinance. 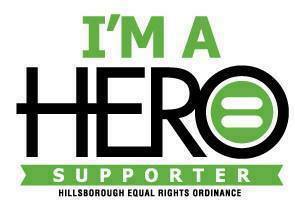 The HERO would ensure that no one in Hillsborough County can be discriminated against because of their sexual orientation or gender identity. Right now, 27 places in Florida have already passed similar ordinances, and it’s time for Hillsborough to catch up. A DPR would allow participants to be notified in an emergency, have access to a partner in the hospital and make medical decisions for a partner who is incapacitated, among other protections.